I am totally in love with this weeks color combo! It's so bright and summery! I feel like these colors go together so well but I don't know that I would have reached for them! That is why I love this class so much! So many great color combos and so much incredible inspiration! I took 3/4" strips of the colors in the background and attached them randomly! Then I added some Pure Poppy ribbon and a bow! I used half of a Nestie shape for the sentiment which is from my new Lawn Fawn set, Clear to See! I so love this font! Then I rounded a corner and added some bling! Love your creations, Laurie! Especially how you did the stars! Fabulous! Leigh send me your info and I will have your magazine sent your way! Thank you all for stopping and leaving the most amazing comments! You all truly made my day! I stopped over to the PC blog and read those comments too! You have no idea how much those meant to me as well! I was really just blown away!! Beautiful, I absolutely love it! FRESH colors and a super juicy card :) Love it! Nice card, Laurie! Love it. You totally rocked these colours! I love the little pearls and that half frame the sentment is on. Love this! So simple & lovely. I haven't had a chance to play with this week's combo yet - hope I can tonight! Great card - love it!! FRESH AND FUN ......... LOVE IT!!! This card strikes me that this would be the perfect card to describe your personality!!! And you are so right the colors are totally FAB!!! Great design! i love your use of the colours! Wonderful card! Oh...those colors literally pop off the page! Great card with all the perfect finishing touches Laurie! Laurie.......I love this card!!! So fun and bright and just perfect with that saddle-stitch bow. I agree about this color combination.......I'm totally in love with it and it's easy to use, but I would never have used them together on my own! Those colors are so summery - they go perfectly together. Great card! I totally puffy heart this card Laurie! Fun LO and super fun way of putting the colors together! You rock! Lovin it too!! Love the colors and the perfectly clean and simple design. You rocked it Laurie! What a fun design and great use of these colors! My favorite part is that cute little trio of pearls! Beauteous supreme-o! 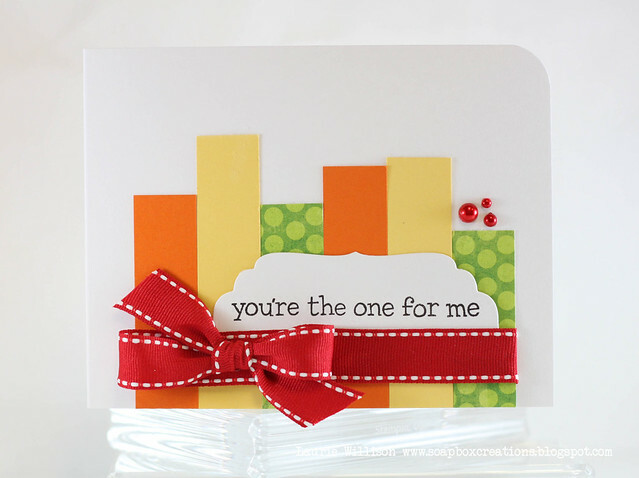 I'm with Christina, those pearls (along the rounded corner) totally make the card. That's the Laurie genius at work. Beautifully sweet and simple. I love it! Definitely going to use it for some inspiration, thank you Laurie! Can I just CASE you for this class? can I claim that you telepathically stole my idea and therefore it's actually mine and you CASE'd me? Ah....this card is so refreshing! Love how you used the bright, fun, summery colors. And, your choice of sentiment is brilliant!!! This is sooo awesome!!! Love it!! Fab-U-Lous! Oh this totally rocks, girlie! I adore that cluster of pearls - so sweet, bright and summery! Great way to use scraps. Love the modern look of this card. I especially like the little red bling. Great use of those colors Laurie! Love how the polka dot panels fit the colors perfectly! Great way to use those scraps up! so bright, cheer and perfect, by the way are those the SU acrylic blocks under there. Gotta get some of those, they look divine!!! 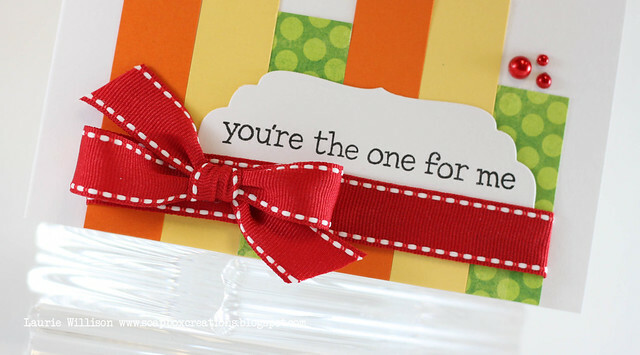 I love this card, and the sentiment is perfect popping out of the ribbon! I absolutely LOVE this...the colors and design are awesome!! This is so beautiful. Love the happy colors. Laurie, congrats on being selected as one of Jennifer's picks this week. Doesn't look like this color challenge was that difficult for you. Can see why others said they will CASE this card. It's gorgeous! Laurie, congrats on being chosen again to be in the spotlight at Card Camp! And congrats on making Gallery Idol Top 20! And Congrats on your Stamping Royalty win! You are doing awesome!!! What a roll that you're on, couldn't happen to a nicer person! Congrats Laurie! I absolutely love this card!! Congrats on the Spotlight; very cool design! Oooo! Such a cool design! LOVE this color combo, and your bow is absolutely perfect! Congrats on all your recent accomplishments. Very cute card. i love the red saddle stitch ribbon - a nice punch of color. A little inspiration and my Craft Space!